For the last few years I have been doing most of my DIY projects on an old singer 403a home machine. While pretty stout by today's standards, as I get better at sewing and more bold in my undertakings I am finding myself limited by my machine more then my skill. Time for an upgrade. A few years ago I did a bunch of research on industrial machines, and much like cars, guns, or knives there are far too many differing opinions on brands. Juki, Brother and Pfaff seem to be the popular ones and I assume any of them will do what I want to do assuming I pick the right model. Lately I've been seeing quite a few Japanese made Jukis on craigslist so that is what I am leaning towards, but I have one main question. In the scope of my research I heard a few differant people extol the Unison Feed sewing machine (a walking foor and needle feed combination, there are a few other names for it as well I believe) but due to the speciallized nature of sewing machine needs, I don't know how many of these people were speaking of leather working, car upholstery or sail making. Specifically for cordura, hypalon, and nylon webbing (90% of all my projects) what is the best feed mechanism? I've gotton away with bottom feed for a lot of things, I have limited experience with walking foot (seems nice) and no experience with needle and unison feed. I would rather spend a little extra and just buy right the first time. If there is not too much difference between types the winner would be the one that could do silnylon as well, but that's a much lower priority. I know Even has an industrial, a few other folks probably do. Anyone ever worked production or been to a factory like First Spear? what do they use? I don't own an industrial, however I remember there was a good section on machine choice in the FAA master parachute rigger handbook. 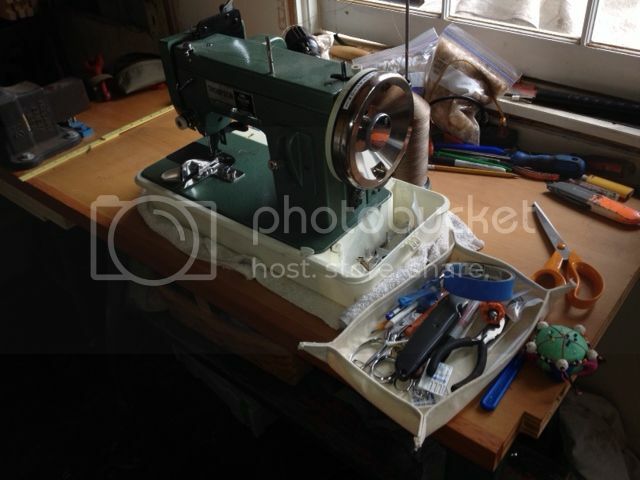 What would be a good heavy duty sewing machine for a layman like me? I'm mainly interested in one for gear & outdoor clothing repairs and mods. I want to be able to use the spools of heavy duty Rigger's thread I have, and be able to sew 1000d, 500d, mil-spec webbing, 1" tubular, Cordura, etc. My wife's sewing machine is a good quality one, but it's not strong enough to handle heavier tasks, and it does not provide good access to shoulder sections, cuffs, etc. I've been looking at the Singer 4423, which seems to offer the features I want, seems basic and user-friendly enough for me, and is not extremely expensive (~$199).What are your thoughts on this machine? I've been doing most all of my repairs and mods to this point by hand stitching with heavy duty thread and strong needles, or using a sewing awl/speedy stitcher. I sewed in the stovejack on my Exped tent using these methods. It obviously took much longer that way. First off, you're not going to be able to sew using the rigger's thread unless you have a belt driven table mounted industrial machine. The motor that runs my main sewing machine is bigger than the machine itself, not inside of it. For reference, just about all heavy duty gear is constructed using 69# thread. That is First Spear's standard. I feel it is a little on the light side for packs if you're just relying on straight stitch (no bar tacking, no edge binding, etc). With the use of all of those construction techniques which require special machines, 69# is more than enough. It's also more than enough for any kind of clothing and light bag and general gear repair. 69# thread is sold in most fabric stores as "upholstery thread". I've got a cone of 92# thread which I'm working off of right now which works well for my prototyping needs and is what I've used for leather projects in the past as well. I think your rigger's thread is heavier still than 92#. Generally, you can run 69# thread in a good quality home machine using heavier needles. However, feeding can be a problem. As in the machine's motor and feeding mechanism can't pull the work (the fabric or webbing) by itself. It's not necessarily right, but I did plenty of hand feeding back in the day. You don't get even stitch lines, but it can work. So, if you buy a basic decent quality home machine you should be able to do clothing and light gear repairs using 69# thread and some finesse. You should be able to work in 500d, 1000d, and flat webbing. Maybe 2 - 4 thicknesses of cordura with a single thickness of flat webbing thrown in - just enough for pack construction. If you want to do the webbing and heavier thread work you're talking about, you have to go all the way to a belt driven walking foot industrial. I don't know if there are any machines that occupy the middle ground between those two. The Singer 4423 looks like it gets mostly panned in reviews. I suspect because it is billed as a "heavy duty" machine which leads people to expect it to be more than a home machine, which it isn't. The longevity issues people talk about might or might not be related to them trying to use it as a heavy duty machine when it isn't really. Thanks, Evan.....that's exactly the kind of info I needed! At least I've now got more knowledge on what I shpould and shouldn't buy for a decent machine for repair work! Evan also interested in this and want to learn. I found this http://denver.craigslist.org/atq/4488864508.html and was wondering if this thing would do the trick for outdoor gear. Id love to learn the craft as I have some great ideas in my head for custom gear for myself. Also be nice to repair my own stuff. Evan is definitely the guy to ask about machines, but just for reference our heavy machine came out of a leather shoe factory and was reconditioned prior to us purchasing it. We originally got it for making leather items for motorcycles, and holsters. It was just fortuitous that HPG came about. My recommendation is to make some light material pieces on a less expensive machine and don't dive in buy making a big purcahse. I can do some very basic stuff, on our big machine, and more complex stuff on a regular machine. I stopped using our big machine because I always ended up breaking it. I just didn't have the finess or experience to run it. SHTF, tough to say on that Singer. My lightweight machine is a 1968 Singer which is a very very good machine, but doesn't like to feed anything thicker than typical garment weights. Just because a machine is older and more robust (like these older Singers) doesn't mean it can automatically handle typical pack materials. Some of you may have heard of the SailRite machines. They're meant to be "portable" walking foot machine marketed towards cruising sailors for onboard sail repair. 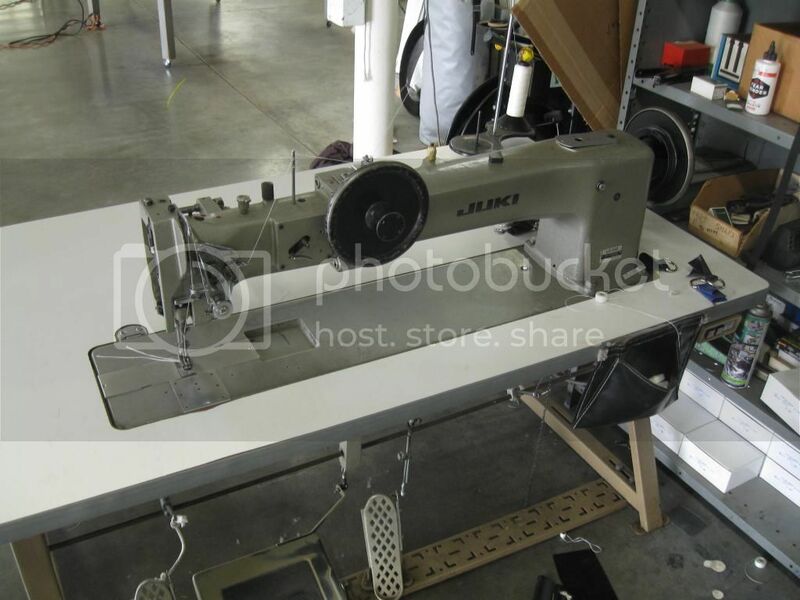 They are about the size of most home machines but much heavier, have a walking foot feed (moving fabric feeders above and below the material you are sewing), and have a thicker material capacity. Some of them do zig-zag, some don't. I found this Thompson machine locally on Craigslist for about a quarter of what the sailrite's sell for. It is exactly the same - made in the same factory, apparently, but marketed differently, and all parts are interchangeable. At first I was sorely disappointed, but after reading up on the sailrite forums, I bought their "Monster Wheel" flywheel - you can see the big shiny wheel in the photos. Sure enough, as many people say, they should just sell the machine with it on it, because it makes such a difference. It slowed the machine speed down to a nice manageable speed and seems to give it much more "torque" going through heavy stuff. Smoother and stronger. I've sewed multiple layers of 500d cordura with no effort, and several firefighter truck belts with two layers of thick FR webbing with no problem. My 1960's Singer touch and swear couldn't do that. I would say that if you find one used, it would be worth it for a hobbyist - not a production shop. Unless you absolutely need a portable machine, I wouldn't spend the money on a new Sailrite. I would opt for a used industrial machine for the same or a bit more. That said, I'm happy with my setup - I guess it's the closest to a relatively low cost but still quite heavy duty industrial-like machine. 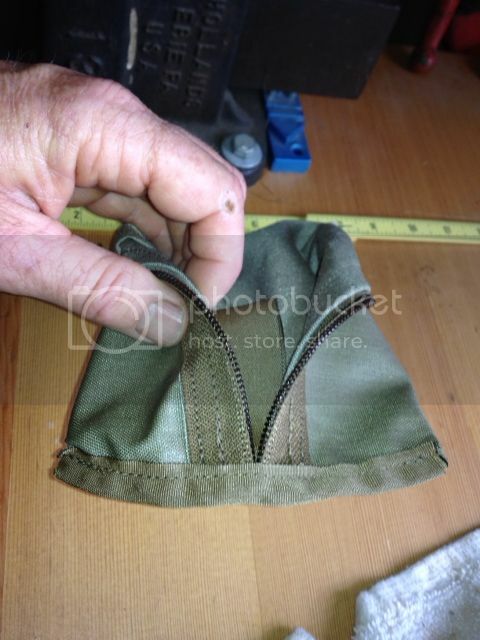 Here's a "pullout" I just made, with the one picture showing the inside seam detail. 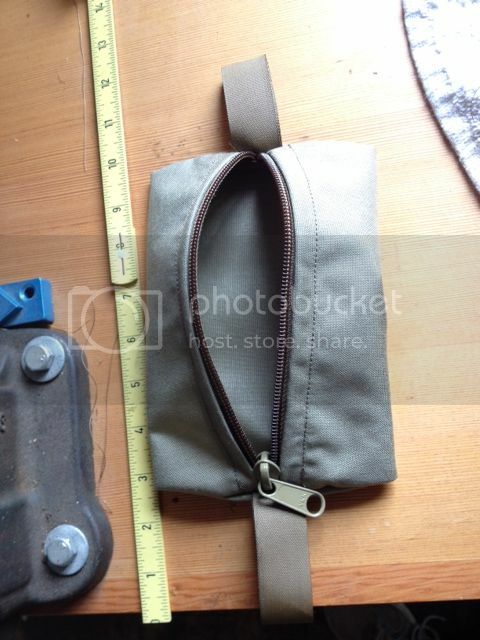 That seam at the center is two layers of 500d, four layers of grosgrain and the #8 YKK zipper. The machine cruised through it like it wasn't there. I have Thompson like that but with no walking foot, I'm assuming that makes a pretty big difference because mine is wimpier then my singer home machine. I'll have bust mine out again and see if it just needs a tune up or if I that monster wheel would help any. By 403a will do like 6 layers of cordura, on my last project I fought through 6 layers of webbing and 2 layers of cordura, but you throw one layer of stiffer webbing at it and it just gives up. Congrats on your new gig! Any chance you can use a machine after hours for personal projects? I pretty much only see benefits for an employer with that arrangement. Wish I knew more about sewing and had some skills. Guess I need to dive more into it. 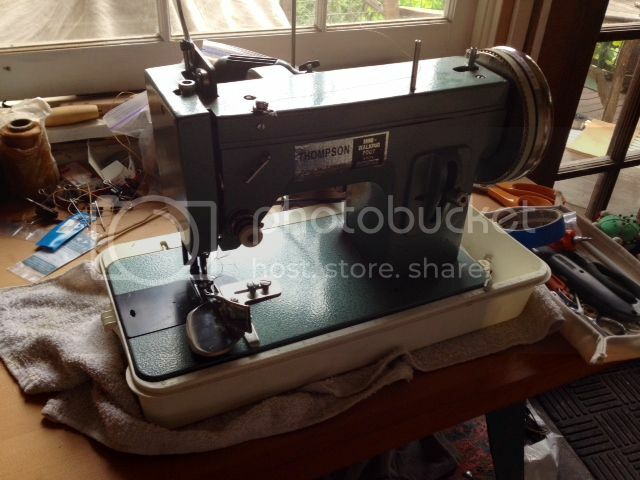 My mom sews and is talented enough, and has an old Brother machine that is old and well built. A few years ago I picked my mom up an Adler table mounted industrial machine from Snakey. All I know about the machine is that it's 1/2 hp, is unreal heavy for an little machine, and it sews canvas pretty easy. yes, they are smart enough to encourage us to make our own stuff during breaks, I've been working on my camp shoe pattern and cranking out tote bags like crazy. They make wall tents and truck tarps mostly, so their idea of a "scrap" is like 3ft^2, I'm getting quite a stash of 10oz canvas and some 22oz vinyl. I've also been learning a lot about what I want in an industrial machine, I've found out I'd be willing to pay a good bit extra to get automatic thread cutting. They mostly run needle-feed mitsubishis so I'm still waiting to try out a compound feed. oh, and disposable bobins have changed my life.